SEOUL/TOKYO, Aug. 17 (Yonhap) — South Korea vowed to take “stern measures” on Friday unless Japan withdraws its proposal to take the issue of Dokdo, Seoul’s easternmost islets claimed by Tokyo as its territory, to the International Court of Justice (ICJ). “We make it clear that the Japanese proposal does not deserve even a passing notice as there is no territorial dispute over Dokdo because it is clearly a Korean territory historically, geographically and under international law,” Seoul’s foreign ministry spokesman Cho Tai-young said. The proposal, which was immediately rejected by South Korea, is not feasible because Tokyo must secure Seoul’s consent to have the issue heard at the ICJ, Seoul officials said. “Our government will take stern measures against any provocations by Japan over Dokdo,” Cho said, declining to elaborate on what actions South Korea would take against Japan. Adding to growing diplomatic tension, Japan’s Finance Minister Jun Azumi confirmed that Tokyo will “reconsider” a currency swap arrangement with South Korea, in the latest sign that the diplomatic chill has swelled to bilateral economic and other relations. Relations worsened after South Korean President Lee Myung-bak visited Dokdo on Aug. 10. Lee cited Japan’s unrepentant attitude of its wartime atrocities during the unprecedented visit that prompted Tokyo to recall its ambassador to Seoul. On Friday, Japan’s Chief Cabinet Secretary Osamu Fujimura announced the proposal to take the issue of Dokdo to the ICJ, but the proposal was met with an immediate refusal. “As we have spoken about this issue on many occasions before, we will not respond to the proposal by Japan,” a senior Seoul diplomat said on the condition of anonymity after Fujimura’s announcement. It was the first time since 1962 for Japan to make such a proposal to South Korea, the diplomat said. In Tokyo, the Japanese finance minister said he will reconsider the agreement with South Korea to expand a currency swap to US$70 billion and canceled a meeting set for this month with South Korean Finance Minister Bahk Jae-wan. Dokdo has long been a thorn in relations between South Korea and Japan. South Korea keeps a small police detachment on the islets, effectively controlling them. Japan has long laid claims to Dokdo in school textbooks, government reports and other ways, undercutting better ties between the neighboring nations. The territorial claims have also been viewed by South Koreans as a sign Japan has not fully repented for its imperialist past, along with Tokyo’s strict unwillingness to address long-running grievances of elderly Korean women forced into sexual slavery for Japanese troops during World War II. 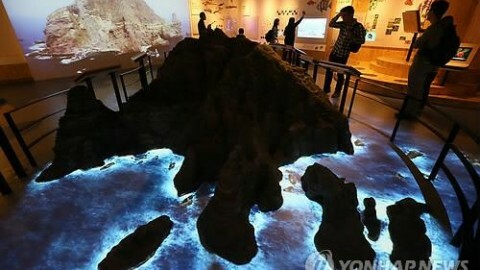 Related to the diplomatic row with Japan, lawmakers from the ruling Saenuri Party said in a meeting with government policymakers that there is a need to exercise caution when dealing with Dokdo. “Policymakers should consider warnings that Seoul may be playing into the hands of Tokyo’s strategy of trying to show the world that the sovereignty of the islets is in dispute,” said Ahn Hong-joon, head of the National Assembly’s Unification, Foreign Affairs and Trade Committee. Rep. Yoo Seong-min and other lawmakers also said that plans to carry out a military drill around the islets should be carefully enforced since it could escalate tensions. South Korea’s military is expected to conduct an exercise early next month around Dokdo that involves deployment of marines as well as the use of warships and fighter aircraft.